Altered lipid metabolism may be a key signature of cancer. Here, label-free stimulated Raman scattering imaging reveals the storage of cholesterol ester in lipid droplets (bright dots) in aggressive human prostate cancer. 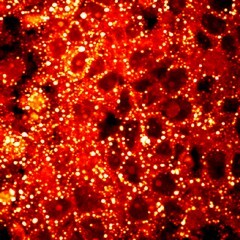 This finding may lead to new cancer drugs that work by blocking the activity of cholesterol esterification.